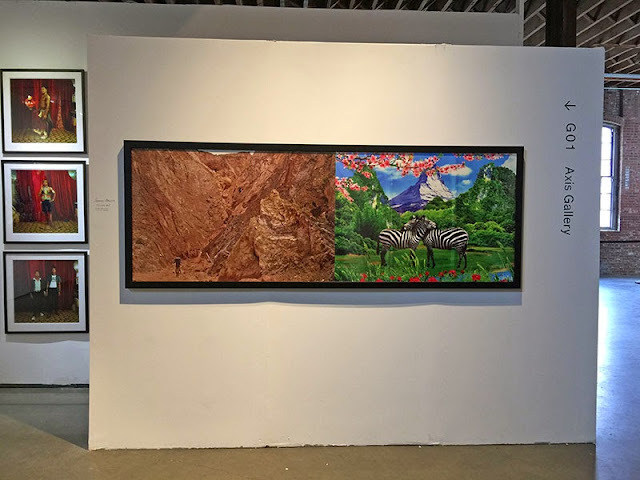 DOEprojekts was pleased to view and participate in several art projects and cultural programs offered by 1:54 Contemporary African Art Fair NYC and Frieze NYC. 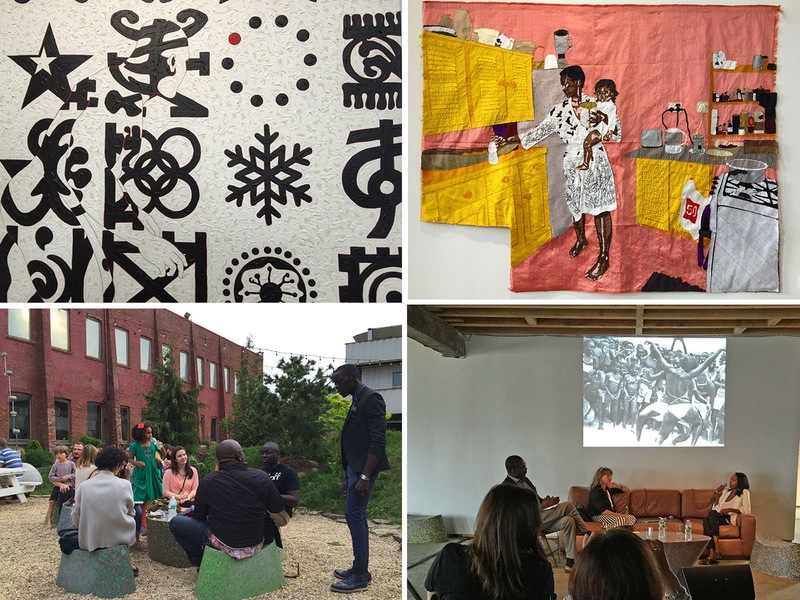 At 1:54 African Art Fair, we spoke with Lisa Brittan, gallerist, Axis Gallery, NYC, and Ugochukus-Smooth Nzewi, Ph.D, Curator of African Art at the Hood Museum of Art, NH. Dr. Nzewi moderated a lively and informative presentation by both Lisa Brittan and Mariane Ibrahim-Lenhardt, Director of Mariane Ibrahim Gallery in Seattle, WA. Both Ms. Brittan and Ms. Ibrahim-Lenhardt spoke about various artists all over the world, including Africa, who work across many social and cultural boundaries — both women affirmatively used the word "hybrid" in their presentations. 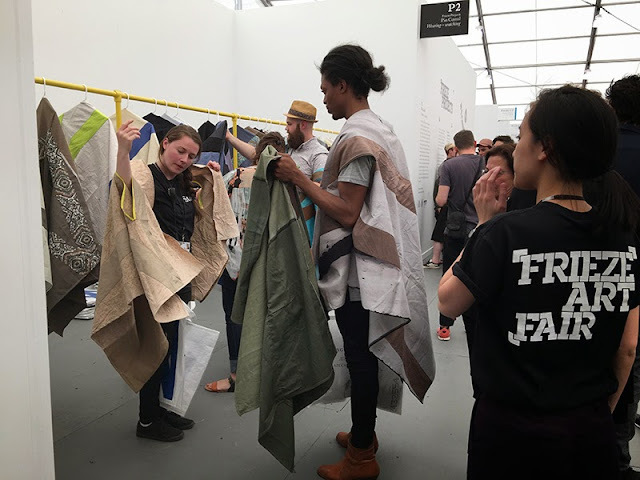 Frieze NYC advertises itself as one of the world's leading art fairs, complete with "cutting-edge" high-priced art objects. 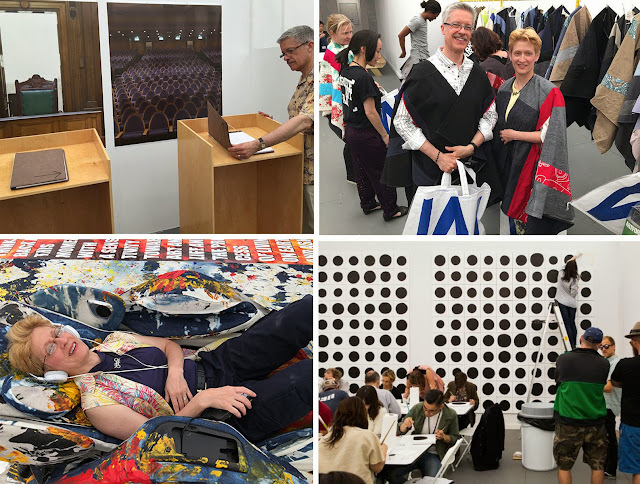 DOEprojekts especially enjoyed the participatory programs at Frieze this year including Pia Camil's Wearing-Watching (we appreciated the gift of two free wearable fabrics -- although we waited in line for an hour to choose them), a Tribute to the Flux-Labyrinth (1976-2015), Korakrit Arunanondchai's Denim Massage Chairs (a definite favorite after walking-walking-walking for 2 days), and Aki Sasamoto's Coffee/Tea. We thank these artists, and Frieze, for offering participatory art experiences and free art objects. 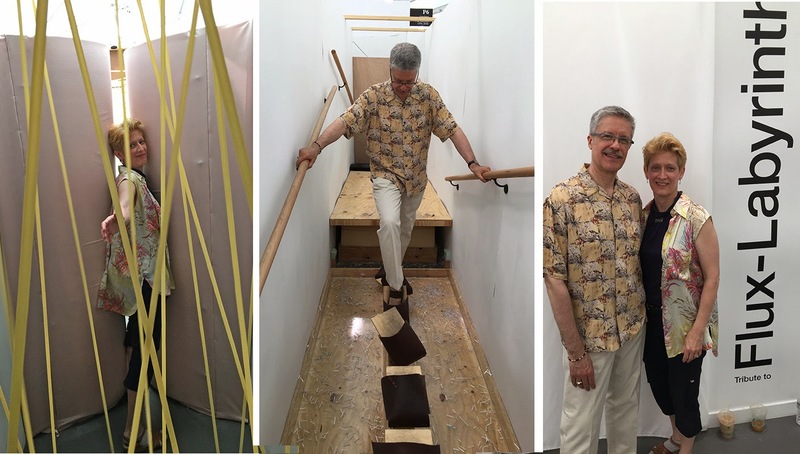 You are inspirational to our conceptual and socially-engaged art practice! 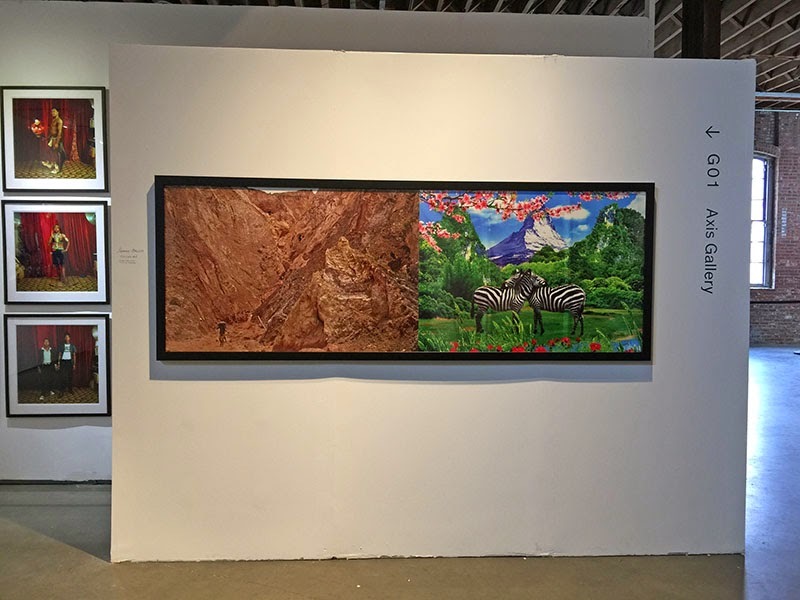 Also inspirational was the generosity of our "Gestures of Hybridity" 3Arts Matching Grant Supporters. We thank all of you from the absolute center of our hearts! 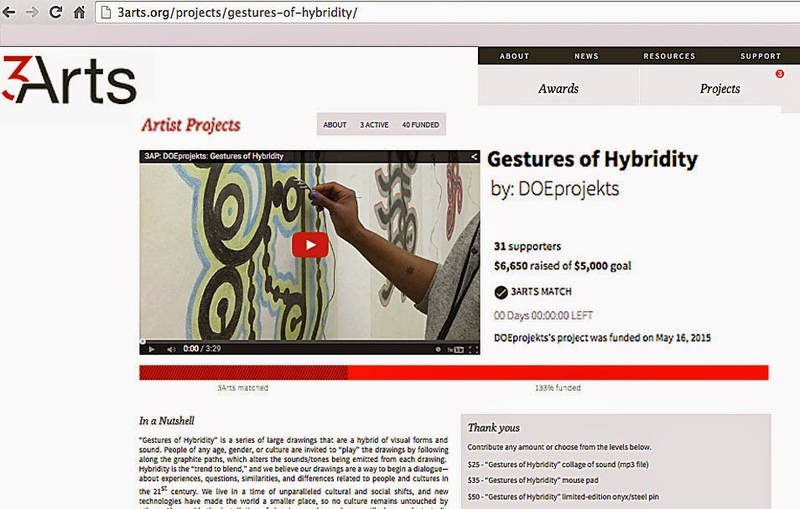 With your support, we exceeded our matching-grant target, receiving 133% of our goal. We will be using these funds to conduct studio workshops in Hamburg, South Africa, and Berlin, Germany during summer 2015, as well as other ongoing workshops in NYC. We will keep you informed through this blog and our Facebook page. 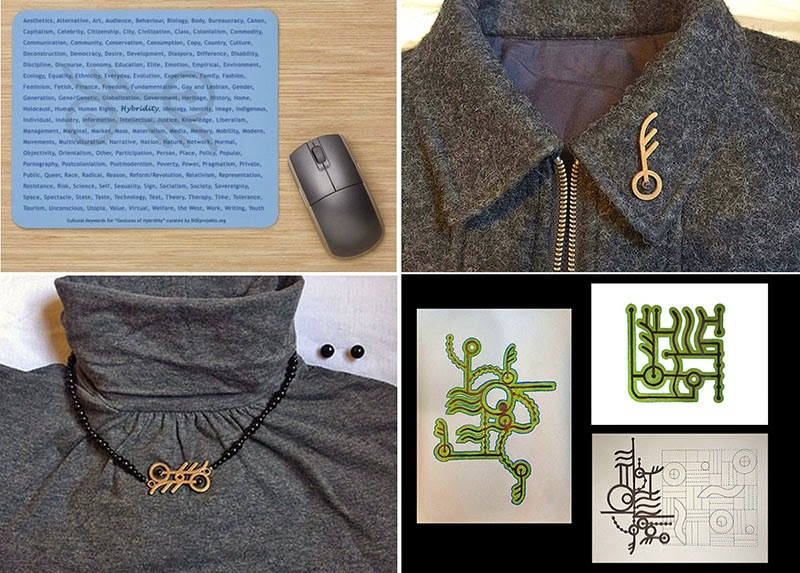 Above are the "thank you" art/objects we offer to our supporters — and we are always hoping to share our work with both familiar and new viewers and supporters. Please keep in touch with us through DOEprojekts@gmail.com or through our blog (RSS feed) and websites! Thank you, thank you, and we look forward to hearing from you!